Bounce Energy, online at bounceenergy.com, offers energy plans to suit your home or business. Bounce Energy is committed to cutting energy and electricity costs for Texans, and Bounce Energy offers fixed monthly plans and month to month plans based on energy usage. Bounce Energy also has green energy plans, electricity and Direct TV bundles, and rewards programs with American Express and American Airlines AAdvantage. With low competitive rates, rewards benefits, and convenience, Bounce Energy is more than just an energy company. But before you sign up, be sure to get all the latest BounceEnergy.com discounts, Bounce Energy promotions, and Bounce Energy coupon codes found here at RetailSteal.com. 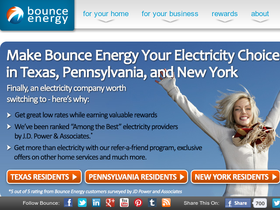 Get a $75 credit for your new account at Bounce Energy when you use this coupon code. Click to start. Use this coupon code at Bounce Energy and receive a $50 credit with sign up. Start now. Bounce Energy rewards customers who pay on time for 24 consecutive months with $50 gift card. Sign up today. Pay your bill on time and Bounce Energy will give you 3% cash back on future payments. Texans, pay your bill on time for 24 consecutive months and enjoy 1 free month of electricity. Sign up today at Bounce Energy to enjoy rewards. Shop plans at Bounce Energy from as low as 7.6¢ per kWh. Click here to get started. Sign up for organic energy plans, starting at only 8.2¢ per kWh from Bounce Energy. Click here. Get started today at Bounce Energy with month-to-month energy plans. No contract necessary. Click link to start.